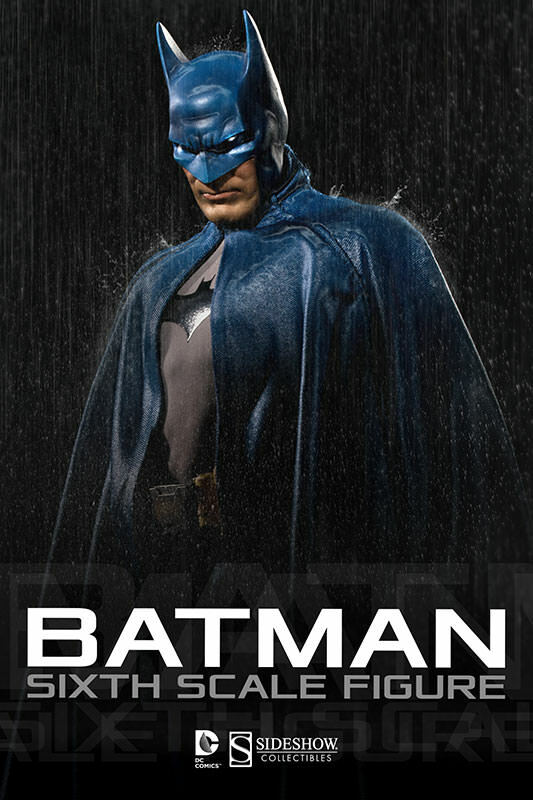 This whole year of 2014 is dedicated to all things Batman, as DC Comics’ legendary Caped Crusading superhero celebrates his 75th Anniversary. It comes as no surprise then that a lot of wonderful toys and merchandise are coming out to honor The Bat’s diamond year, and that includes speciality and collectible manufacturer Sideshow Collectibles, who have something new and retro to offer for fans of The Dark Knight himself. Offered as one of the new figurines in their line-up of DC Comics licensed action figures, this amazing Exclusive Batman Sixth Scale Figure is an intimidating and wonderful collectible that Bat-fans may want to look into. Similar to the Regular Edition, this toy molded after The Dark Knight’s likeness has two mask options that allow him to sport short or longer ears on his cowl, giving fans the option and variety to dress The Caped Crusader as one of his many interpretations seen in comics. 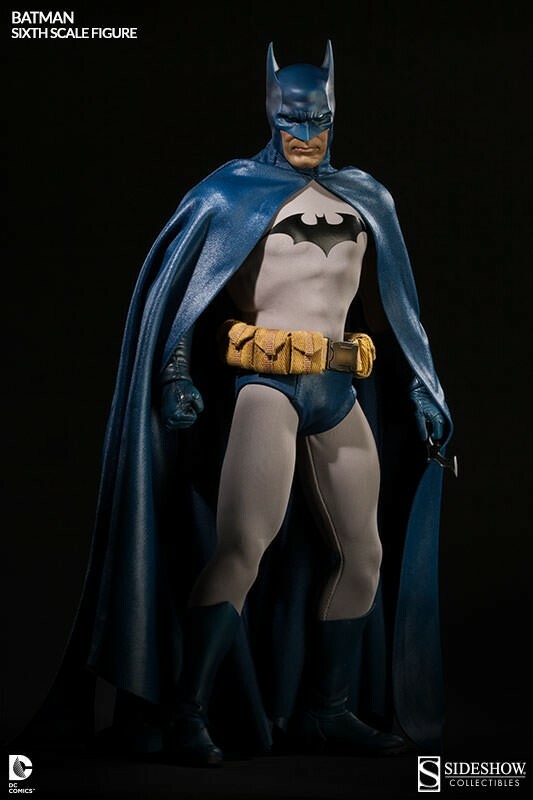 The look of Sideshow Collectibles’ Batman looks very similar and is possibly inspired by Jim Lee’s fantastic design of the character during his acclaimed run with writer Jeph Loeb on Batman: Hush. Sporting multiple accessories and gadgets, including his trusty Batarang, Grapple Hook Gun, and Utility Belt, this Batman figure is definitely an eyecatcher for fans who want to be inspired by a symbol which they can display gloriously as part of their collection. 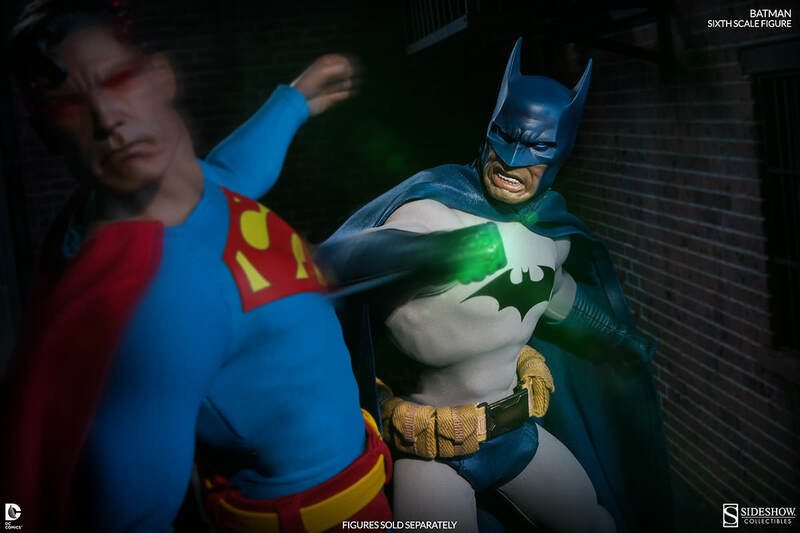 Additionally, the figure has two facial expressions that can be interchanged to give Bats a more “angry” face when he wants to strike fear or do battle against those he needs to face… Such as Superman in this battle scene between The Dark Knight and The Man of Steel from Hush that Sideshow has beautifully recreated. with the Superman Sixth Scale figure sold separately of course. Naturally, the Batman figure has the Kryptonie Ring entrusted to him by Supes, showing just how faithful the toy manufacturer is in terms of paying attention to detail and comic book canon. To get a better glimpse of Sideshow’s offering, here’s a video ad that the company has put together to show why this figure embodies Bruce Wayne’s creed and dedication to becoming a symbol of justice. 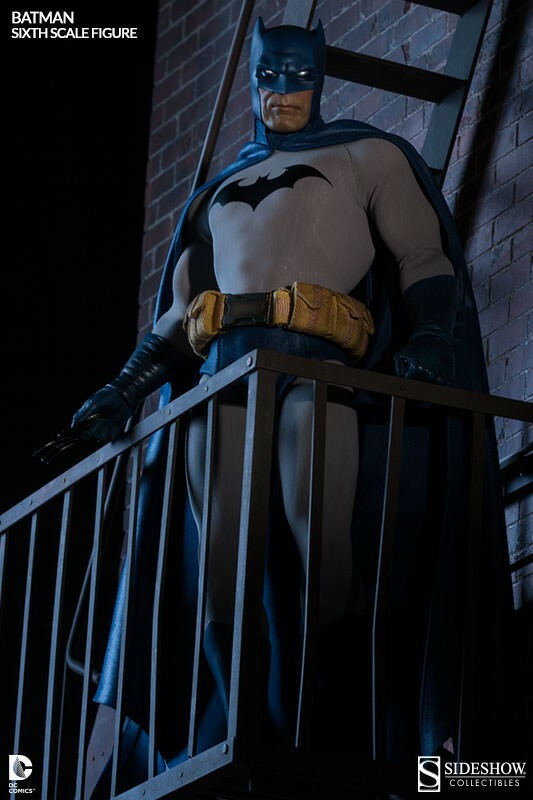 The Sideshow Collectibles Batman Sixth Scale Figure is now available. Find out more details by visiting the official source post and website here.